Commissioned by Dorothy for her son Shane's first birthday is this Tigger cake featuring a 3D “Baby Tigger” sugar art figurine. 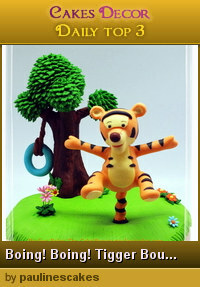 I wanted this Tigger figurine to be unique for this cake so I challenged myself to make him appear to be bouncing (standing) on his tail, with his legs up. To complement the scene, I also made a 3D sugar tree topper with branches of royal icing piped leaves and Tigger’s favorite rubber tube swing hanging on one of the branches. Tree with Tigger's favorite tube swing! Shane's first birthday cake... Tigger Bounce! "Tigger Bounce" made it to Number 1 at CakesDecor.com on March 15, 2013! 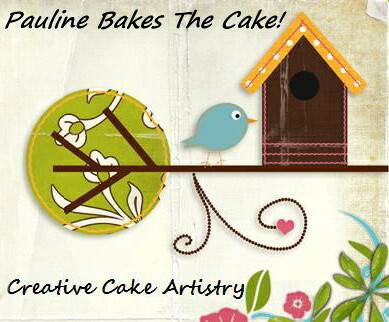 Tigger Bounce cake made it to the Daily Top 3 cakes at CakesDecor.com on March 15, 2013!